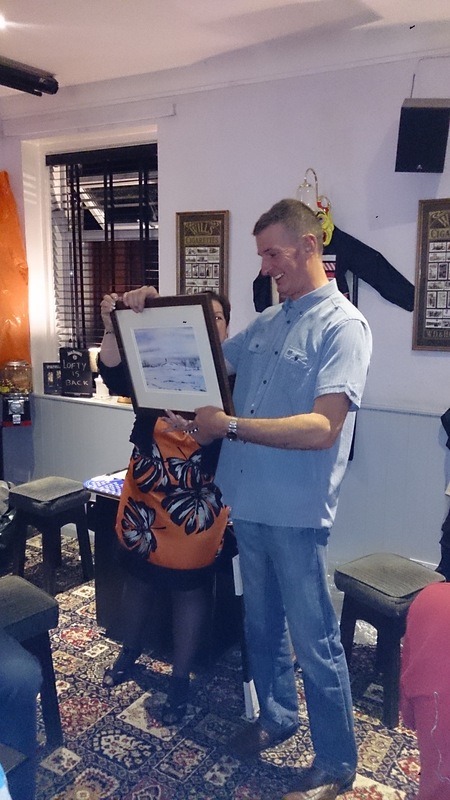 This photograph shows the presentation of my painting, "Castle Hill in the Snow" to John Lander of Newsome Panthers on the occasion of his leaving party. Paintings make unique gifts for presentations and special events. The subject and content of a painting can be specially devised to reflect the interests and achievements of the individual concerned. 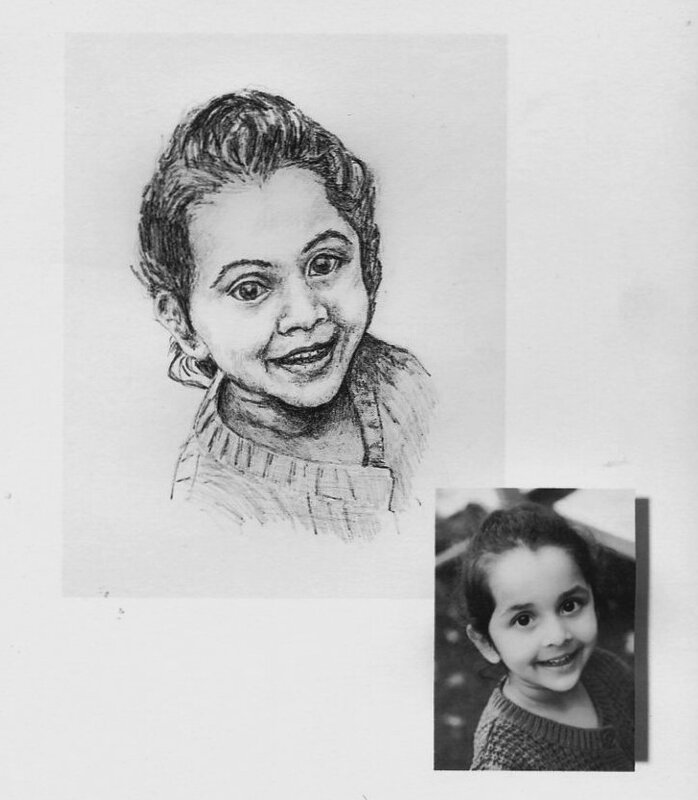 These qualities are determined through discussion between artist and client leading to preliminary sketches for further discussion before the final work is produced. Alternatively any of the works featured in my galleries can be reproduced as a professionally framed print as in the presentation above. I can supply works framed or unframed as desired. The section below includes examples of work that I have been commissioned to undertake. I am happy to work in any media or subject and I am comfortable working from photographs and other reference material. If you wish to discuss a commission please contact me to discuss your requirements with no obligation. Anniversary, Birthday or Life Event Collages. The work above was commissioned as a wedding anniversary gift from a parent. The images represent significant places for the couple and include their respective former homes, The pub where the proposal was accepted during a snow storm, the church where they were married, the reception venue and the honeymoon safari! The two logos represent their respective colleges and Jemima Puddleduck a private joke! I discussed the design in detail with the client who supplied the relevant background info including the personal stories and jokes, and photographs of the locations. Such "Event Collages" make interesting and unique presents for friends colleagues and family members to commemorate significant birthdays anniveraries and life events. Again the commissioned painting can be produced as a Greetings Card, or Party Invitation at £1 each. Illustrations of Houses or business premises. 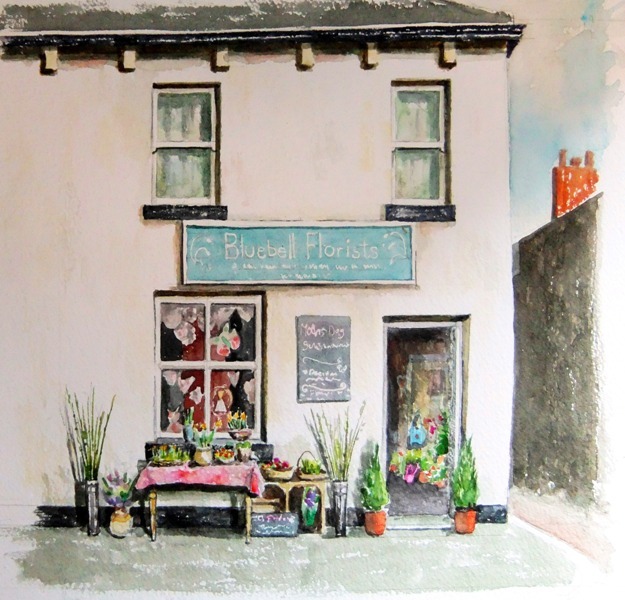 Paintings of houses or business premises can be comissioned in watercolour Oils or any suitable medea. The shop in question is local so I was able to work from my own observations and photographs. I am equally happy to work from photos supplied by the client. Such images can also be used as business cards or greetings cards at very competative prices. 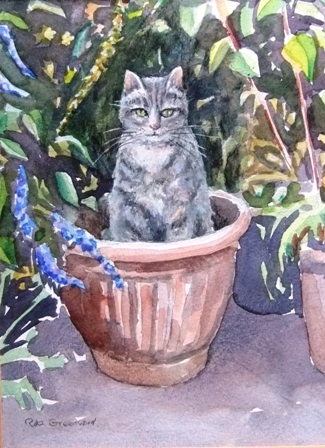 Animal portraits like "Potted Oscar" below make great gifts and can be undertaken in Watercolour Oils or Pastels. Oscar was painted from several photographs along with detailed discussions with the client who decided the title of the work! Greetings cards can also be produced at a cost of £1 each for a minimum of 20 cards.